I've been eager to talk about Rick Owens for a while now -- not just Rick Owens the designer I adore, not the sharp-profiled patron saint of Goths everywhere, but rather Rick Owens as a cultural force, and an oblique successor to the avant garde of the eighties and the cosmopolitan minimalism of the nineties. But let's start with his Spring/Summer 2014 collection. It gained a lot of (well deserved) attention by casting American step teams instead of models. Thing you will notice first is the diversity of the models, which makes sense: they were not selected by a casting director, but came as an entire group of living, breathing American students, with bodies of different heights, builds, weights and of course colors. Another thing that immediately jumps to mind is how easy these clothes are to move in. And how GOOD they look on these women -- all of them. This is really the quintessential Owens' clothing -- interesting but not imposing or assuming, clothes that are mostly black or white or dust colored, cut in an inspiring and often mind-boggling way, and yet so easy. 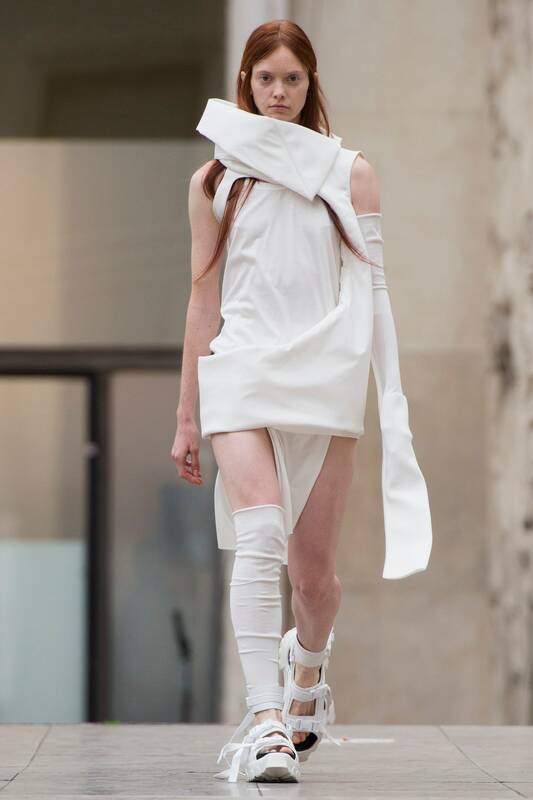 A disclaimer is perhaps in order: I love Rick Owens' clothes. I wear them a lot; they are blank and anonymous. And yet people who also love him will recognize his clothing immediately -- by the drape, but the flattering skim of unraveling and asymmetrical jersey, by a sharp cant of the shoulder. I would not call Owens clothes derivative by any means, as his aesthetic is all his own; and yet it would be a mistake to argue that he has no antecedents. The palette and the indifference in separating eveningwear from streetwear roots him firmly in the nineties, to the works of the Amsterdam six (especially Ann Demeulemeester), as well Yohji Yamamoto. Yamamoto has become a rarefied legend, and yet he was one of the first avant garde designers to actually look to the street, to the "sneaker culture" as he calls it, and to incorporate some very mundane references into the exquisitely cut clothes. Of course there are also more direct points of comparison between Yamamoto and Owens: both reject the explicitly feminine silhouettes, tending instead toward the androgyny. It is never tight but skimming, it is boxy but flattering, bizarre and yet utterly enchanting. From Yohji Yamamoto himself: "Men's clothing is more pure in design. It's more simple and has no decoration. Women want that. When I started designing, I wanted to make men's clothes for women. But there were no buyers for it. Now there are. I always wonder who decided that there should be a difference in the clothes of men and women. Perhaps men decided this." But if it was all there were all to Owens -- the reliance on black and the asymmetry, the unraveling seams and the imaginative cuts -- there would be no explanation for his most recent show, Spring 2018. 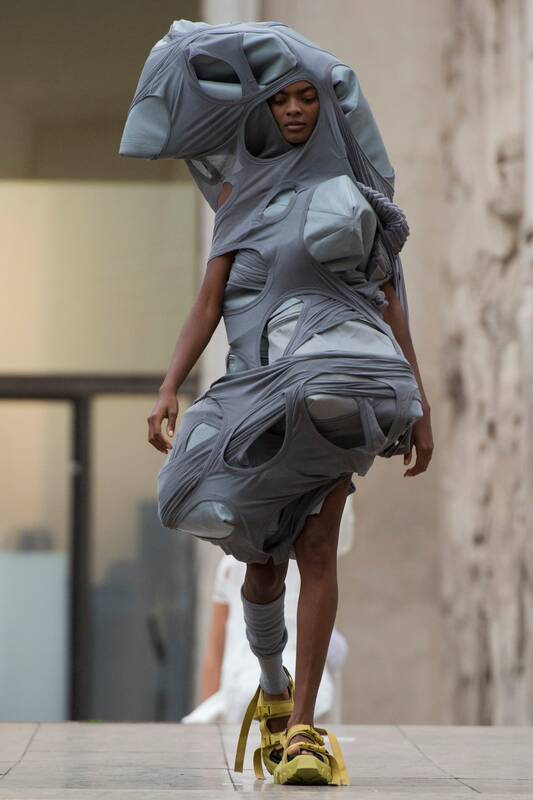 These are professional ballet dancers performing in those lump dresses from Kawakubo's collection. And the attention to the movement, to the three-dimensional reality of clothing and athletes' bodies -- who, unlike models, inhabit the clothes fully instead of walking them down the runway -- brings this all together for me. That Spring 2014 show that was also shown on bodies of dancers. 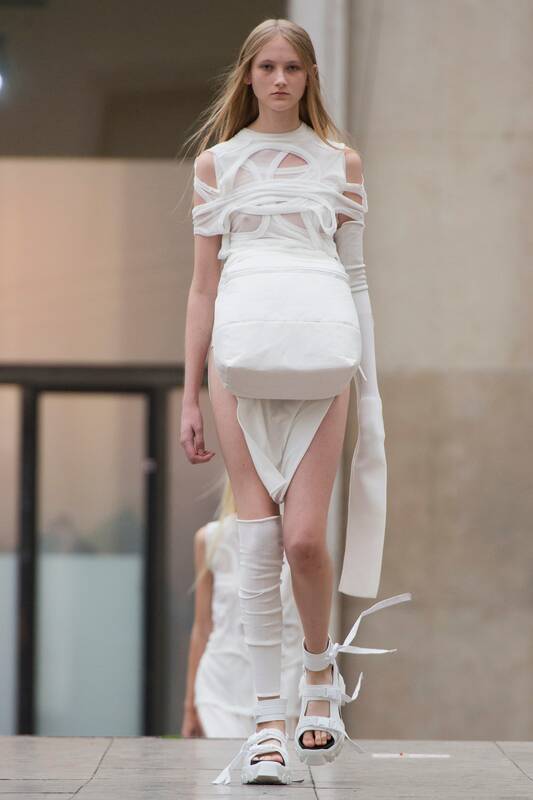 So to me Rick Owens' 2018 show is a love letter -- to other designers, to the evolution of his vision, and to the bodies that move and inhabit clothes, bodies that revealed and concealed, distorted and embraced. It is a love letter to movement in all senses of it -- dance, time, music, human body -- and I am grateful for it. This letter came at the right time.